To Sum It Up: As Sydney strays further and further from her Alchemist beliefs, the danger that she’ll be found out becomes increasingly real. Sydney finds herself needing to keep more and more secrets, an especially challenging task now that her younger sister, Zoe, is shadowing her on her assignment in Palm Springs and is very eager to prove herself as an Alchemist. Sydney has always excelled at foreseeing potential problems and heading them off, but under this much pressure, including keeping a forbidden romance under wraps, not even Sydney may be immune to making an extremely costly mistake. Review: The Fiery Heart brings a significant change to the Bloodlines series. For the first time, there are two POVs, and of course the big news is that one of them belongs to none other than Adrian Ivashkov. I remember when this was first announced and how I had a mini-freak-out because . . . Adrian. POV. Reading from Adrian’s POV! Yes! Perhaps I went into reading The Fiery Heart with a tad too much anticipation because I needed a few chapters to really get into Adrian’s side of the story. I know, I know—what the hell is wrong with me? I’ll try to explain my thinking as best I can. The trademark Adrian Ivashkov snark is there, but maybe I just expected more of it since we had direct access to his thoughts. Instead, a lot of his pages were devoted to his feelings for Sydney, and while I’m 100% Team Sydrian, I also still wanted Adrian to just be Adrian, the guy who always has a smartass remark armed and ready. As I read, though, I started gaining more of an investment in his chapters. Something that may not have been as apparent in the previous books is the extent to which spirit can torment him. It gives him dizzying highs and alarmingly despairing lows, and when he’s experiencing a low, he’s consumed by thoughts of worthlessness. This is the same Adrian whom everyone often perceives as arrogant and carefree. What’s really heartbreaking is that he’s reluctant to give up using spirit because he believes he won’t be able to help people anymore. His biggest fear is not being able to help Sydney if she needed him. Commence swooning now! 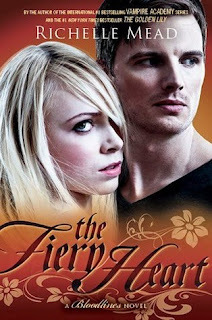 The other POV in The Fiery Heart belongs to Sydney, naturally, and she’s breaking just about every Alchemist rule now. She has evolved into quite the rebel; one of her story lines follows her research into developing an ink that resists the type the Alchemists use to enforce loyalty among their ranks. In addition to her super secret project, she also has to carry out her regular duties, namely keeping her other “family members” out of trouble. This job, which is already tough at the best of times, is made much more difficult by the presence of Sydney’s actual sister, Zoe, at Amberwood Prep. Do not get me started about Zoe; she’s every bit the heap of trouble I expected her to be. I suppose it could be argued that Zoe is the product of some terrible parenting/brainwashing by her and Sydney’s father, but I’m really not in the mood to scrape together some sympathy for Zoe. Although I thought The Fiery Heart started a bit slow compared to the previous Bloodlines novels and once again went into a rather lengthy recap of the series thus far, it did find its groove eventually. The action toward the end was intense, and Eddie got to demonstrate some serious guardian badassery. Waiting so long to read this has actually worked out for me because I can proceed straight to Silver Shadows now and pick up where the head spinning ending of The Fiery Heart leaves off. All in All: I liked The Fiery Heart a lot, but maybe not as much as the other books in the series, despite being able to read from Adrian’s perspective. The pacing felt a bit leisurely for a while, but I did think the novel finished strongly. Haha! He gets his moods, but it's because of the spirit magic he has. I love him for his snark, which never fails to crack me up.